Four on Fish @ Providence – O Hei There! I’ve had this post in my drafts for around three months (the dinner was on June 20), and it’s finally time to finish it. However, after so much time has elapsed, it’s hard for me to recollect the experience in detail. Since it was a one-time dinner anyways, I figured that the details are less important than the photos. So I’ll just be lazy with this post with mainly photos taken by Linh-Nam during dinner (I went with him and Eugenia). 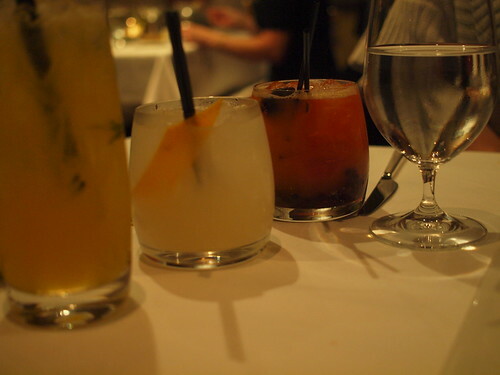 This dinner was hosted by Opinionated About Dining, a Zagat-esque guide, at Providence. Upon leaving the restaurant we were given the guide as a gift. Chef Michael Cimarusti (of Providence) was joined by Chefs Ludo Lefebvre (LudoBites), Hiro Urasawa (Urasawa), and Ricardo Zarate (Mo-Chica, Picca), all providing dishes with a focus on seafood. My first experience of Chef Zarate’s food, which led to my future Picca visits. 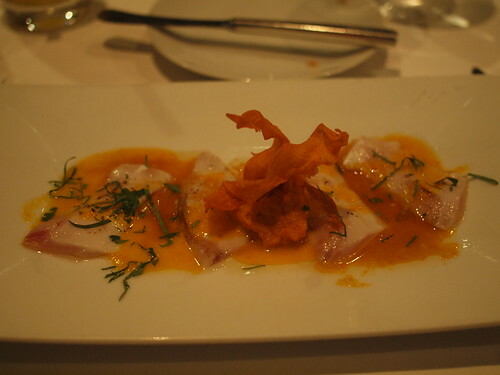 Tiradito is a Peruvian ceviche-esque dish of Japanese influence, and this specific dish is now on Picca’s menu. Great start. The closest I will get to taste Chef Urasawa’s food (that is, until my fated visit next March). 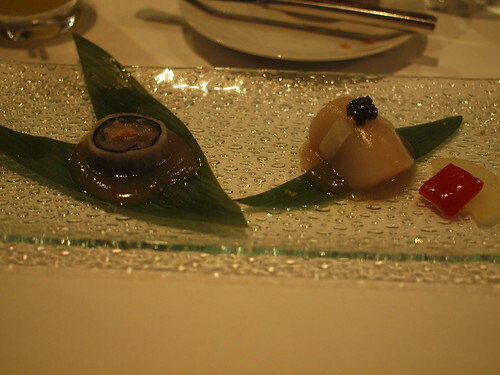 The two seafood items were both served with the plum sauce, which provided a sweet and sour taste. I thought the red snapper and shrimp combination was good, but it didn’t blow me away. However, the scallop and monkfish liver combination was amazing! I look forward to this quality of food served at Urasawa. The second dish served by Chef Zarate, also now on Picca’s menu. 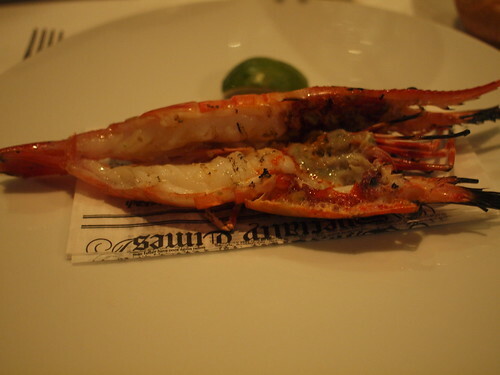 The prawn was perfectly cooked, with a nice char. There was just a touch of yuzu kosho, and with a squeeze of lime that was all this needed, to let the shrimp speak for itself. 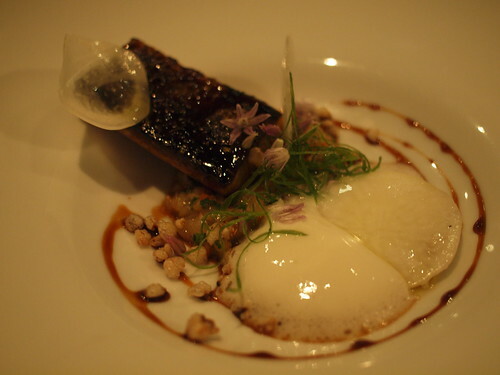 This is one of Providence’s mainstay dishes on the tasting menu (I had another variation of this during my visit to Providence later that month). I loved this dish. The creamy uni went really well with raw egg, and the beurre blanc provided a nice flavor, while the little croutons added a nice crunchy contrast. 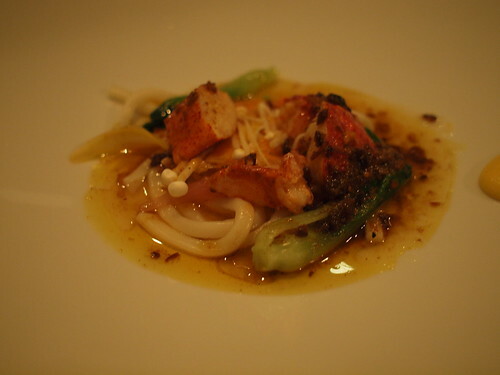 The second dish served by Chef Urasawa. 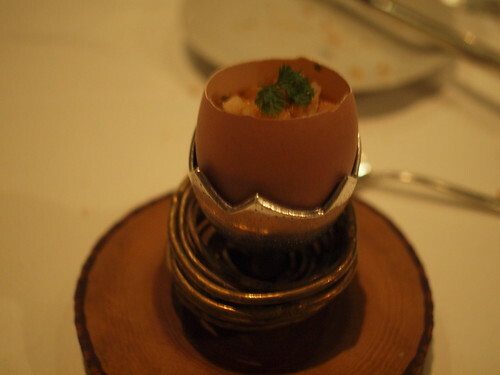 The egg-on-egg dishes served that night were just downright awesome. 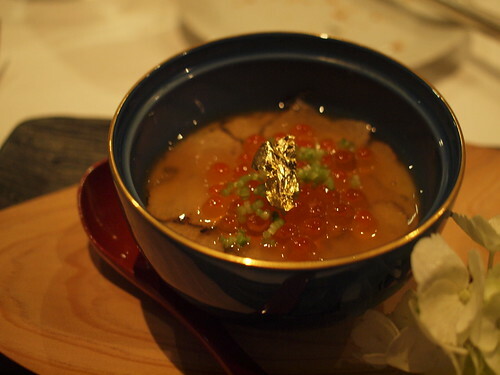 The egg custard had some sea urchin and shrimp underneath I believe, and was topped with truffle shavings, salmon roe, and dashi broth. Just look all all those awesome ingredients. Only negative might be that the truffle shavings were a bit thick for me, but how can one really complain about truffles, let along an abundance of them. Another hit by Chef Cimarusti. The eel had a nice, crunchy skin and delicious sweet eel sauce glaze. The soba was served in bits, which were crunchy and tasted more like bread crumbs than soba (but was still good). The soy gave the dish a nice balance. This dish, by Chef Ludo, is arguably the most aromatically-pleasant dish I’ve ever smelled. The combination of scents coming from the vadouvan butter (vadouvan is a French spice blend that’s reminiscent of curry powder) and an orange-like fruitiness was heavenly. The dish itself, however, was not as good. My lobster, unfortunately, was a little bit overcooked. And I think I would’ve liked the dish to be less…tart. Still good though. A classic Ludo dessert (so I’m told), this panna cotta with caramel sauce had a great salty contrast. 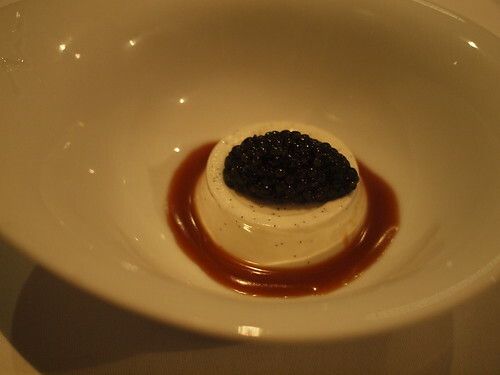 But instead of sea salt with caramel like most places use nowadays, Chef Ludo instead uses caviar to provide that salty kick. 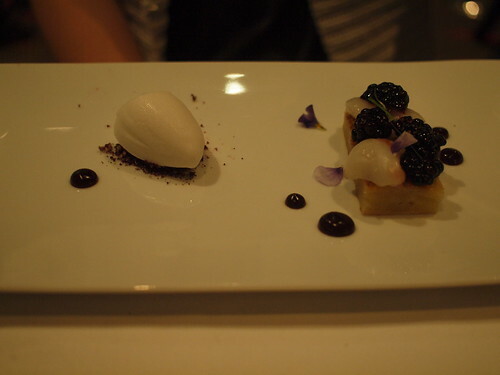 Once you get over the fact that there’s caviar in a dessert, this was quite the combination. Very creative, and a great dessert. 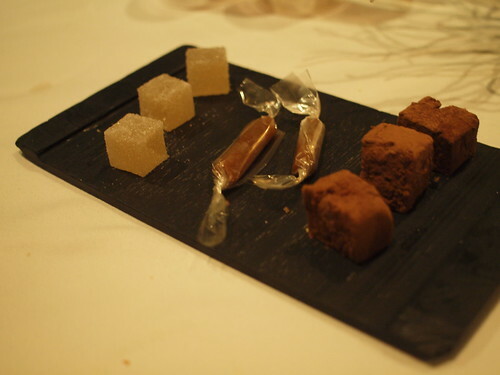 The second dessert, provided by Providence. I had a very similar variation of this at my subsequent Providence dinner. On this visit, it was a coconut-kaffir lime sorbet, as opposed to a soy milk ice cream. The combination of the sorbet with the bits underneath had a Froot Loops-like taste, according to Linh-Nam. Nice dessert. Overall, this was an awesome seafood-themed dinner (albeit a very expensive one), from the minds of four extremely talented chefs. My dinner at Providence was an A, my last dinner at Picca was an *spoiler alert* A- (bumping it up after visit last weekend), Urasawa is by far my most anticipated dinner, and I am praying that I’ll be able to experience LudoBites someday. Only thing that prevented this dinner from being an A was that the different cuisines didn’t necessarily come together as a cohesive progression. I’m not one to be part of the special dinner events scene, but if all of them can be like this dinner, I might have to Paris Hilton the food social scene.